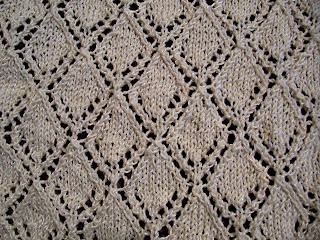 Ideally, I would have made this shawl with a green/yellow/brown, lace-weight wool or wool-blend. Unfortunately, being on a yarn diet means I have to use what I have. I found this yarn at a thrift store about a year ago for roughly $1 per ball, and I haven't been able to find any information about it online. So, substitute at will. CO 3 sts on circ. Rows 1-9: kfb, k to end. There should now be 12 sts. Row 10 and all even rows: kfb, k4, p to last 6 sts, k6. 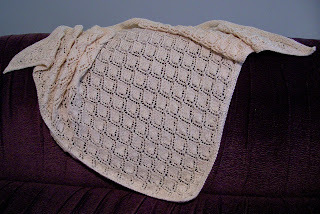 If you would prefer working from a chart, Shae of twitchyknits has created one. Row 11: kfb, k to end. Row 13: kfb, k4, k2tog, yo, k1, yo, skp, k5. Row 15: kfb, k4, k2tog, yo, k3, yo, skp, k5. Row 17: kfb, k4, (k2tog, yo) twice, k1, (yo, skp) twice, k5. Row 19: kfb, k4, (k2tog, yo) twice, k3, (yo, skp) twice, k5. Row 21: kfb, k4, (k2tog, yo) twice, k5, (yo, skp) twice, k5. Row 23: kfb, k5, yo, *k1, yo, skp, k7, k2tog, yo*; rep between *s to last 7 sts, k1, yo, k6. Row 25: kfb, k4, *k2tog, yo, k3, yo, skp, k5*; rep between *s to end. Row 27: kfb, k4, *(k2tog, yo) twice, k1, (yo, skp) twice, k3*; rep between *s to last 2 sts, k2. Row 29: kfb, k4, *(k2tog, yo) twice, k3, (yo, skp) twice, k1*; rep between *s to last 4 sts, k4. Row 31: kfb, k4, (k2tog, yo) twice, *k5, yo, skp, yo, sl1, k2tog, psso, yo, k2tog, yo*; rep between *s to last 14 sts, k5, (yo, skp) twice, k5. Rep Rows 23-32 to desired size, ending with Row 24. Next row, kfb, k to end. Rep this row 9 more times. BO all sts. Weave in ends. Block if desired.